Manto (Urdu: منٹو‎) is a 2015 Pakistani biographical drama film based on the life of Pakistani short-story writer Sadat Hassan Manto, starring Sarmad Sultan Khoosat in the title role. Directed by Khoosat himself while produced by Babar Javed and written by Shahid Nadeem, whose screenplay was adapted from Manto’s short stories particularly Thanda Gosht, Madari, License, Hatak and Peshawar Se Lahore, it also depicts his relationship with singer-actress Noor Jehan. It was released on September 11, 2015, after sixty years of Manto’s death. Q&A with Director Sarmad Sultan Khoosat by Ex-Diplomat and Dr. Kiran Pervez, South & Central Asia Chair Foreign Service Institute US Department of State. Cast: Sarmad Khoosat, Sania Saeed,Saba Qamar, Mahira Khan & others. Khoosat’s first television drama as a director was Piya Naam Ka Diya in 2007 in which he acted opposite filmstar Saima Syed Noor, and Irum Akhtar, Saima’s performance was well received. Then Sarmad directed a soap serial named “Mujhay Apna Naam O Nishaan Milay” which was beautifully written and scripted by “Seemal Numan”, his sister, the drama got huge acclaim due to the acting of the characters played by Irfan Khoosat, the four girls who were his daughters and a woman who played a mother. Khoosat’s drama, Kalmoohi, directed, written by himself and acted by Sania Saeed, Sohail Sameer, Shamil Khan, Nasreen Qureshi, Irfan Khoosat and others began airing on PTV channel in early 2010, also got good reviews. In 2011, he gained significant prominence and acclaim with the drama Pani Jaisa Piyar that aired on Hum TV and also got the best director award for it on LUX Style Awards. He got visible prominence by directing “Jal Pari” which was aired on GEO TV starring Numan Ejaz and new talent Neelam Munir. 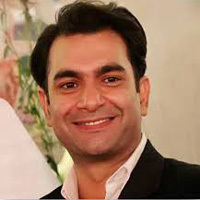 He went on to direct Humsafar for Hum TV, which became an overnight success, receiving positive reviews from Pakistani and International critics, soon after which came “Shehr-e-Zaat” got hugely popular in women of Pakistan. Both the serials were repeated on Hum TV for more than one time due to their popularity. He also wrote the script for Saqib Malik’s production Ajnabee Shehr Mein. He has directed episodes for the drama series Faseele Jaan Se Aagay. Drama serial Ashk. Recently he has completed shooting a new project “Main Manto”, its a big project with a huge ensemble cast, it will be released as a film and later on as a drama serial under banner of Geo Entertainment, on the same channel. Sarmad Sultan Khoosat directed the re-make of the old super hit Pakistani film, Aina(1977), as a tele film. He conducted a workshop at the Lahore University of Management Sciences’s annual amateur film festival in June 2011. Academically, he did his Graduation from Government College University and did Masters in Psychology and also owned a gold medal in it. He was also a very active member of DS(Debating Society) of GCU.